Celebrate summer with this light and fresh spin on a classic picnic salad. The vinegar-based dressing slashes fat and calories and highlights the flavors and textures of the nutrient-filled fruits and vegetables. In a large bowl whisk vinegar, oil, sugar, celery seed and salt. 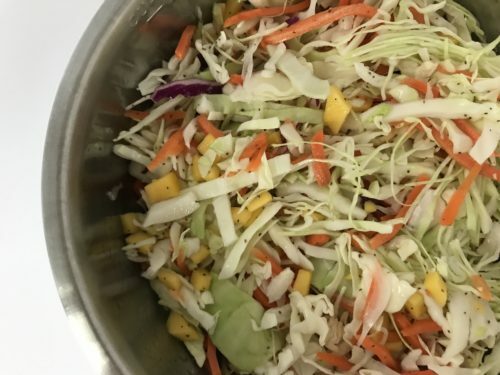 Add cabbage, carrots and mango. Toss well to coat all the ingredients in the dressing. Allow to sit at room temperature for at least 10 minutes before serving or cover and place in the refrigerator for up to 6 hours.